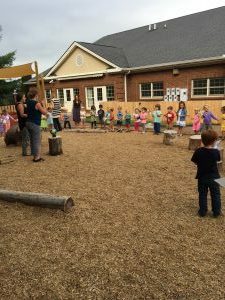 Discovery Montessori School offers a hands on, integrated curriculum in which children participate in a variety of activities that are designed to give support in several developmental areas at the same time. For example, your child(ren) may make homemade play dough during small group time. They are growing cognitively by learning about measurement, color mixing, counting, and reading (the recipe and labels); they are growing socially by taking turns and cooperating; they are growing physically by using their fine motor skills to measure and stir the ingredients and knead the dough; and they are growing emotionally by experiencing the satisfaction of completing a task and the excitement that comes from being part of a group. 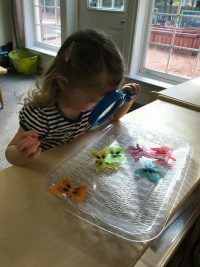 Throughout your child’s school day she/he will have opportunities for learning and growth by participating in group/individual projects, circle time, and child-initiated exploration in any of our learning centers. It is our goal to provide learning experiences for each child that capitalizes on their strengths to enhance their learning in other areas. Describing: colors, shapes, numbers, textures, sizes, etc. Resources: water, energy, sun, etc. Citizenship: what makes a good citizen; democracy; etc. It is our goal to help each child develop their social skills in order to feel confident in their ability to work in a group with other children, work out conflicts through creative problem-solving, and contribute as a valued member to his or her community. Our socially-focused curriculum keeps social skill development in the forefront of all activities. 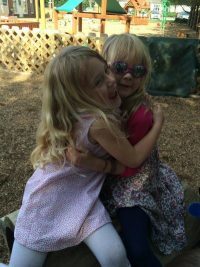 At Discovery Montessori School, our children take care of one another, and learn to be mentors themselves. It is our goal to provide each child with experiences that will promote healthy physical development and a healthy attitude about exercise and nutrition. Children have opportunities throughout the day to develop both fine motor skills and gross motor skills. Hand-Eye Coordination: touching body parts, pointing to objects, using computer, mouse, etc. Using legs to kick, jump, hop, run, walk, etc. To support the healthy development of the whole child, our curriculum offers focused attention on the emotional development of each child.